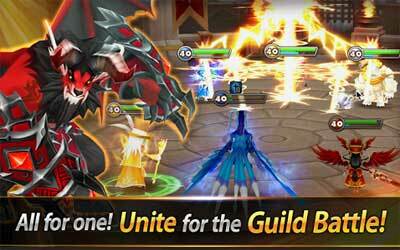 This is old version Summoners War 2.2.2 apk for Android, you can install it if you want to downgrade or install old app. It is top Role Playing apps from Com2uS. Every monster in Summoners War can be upgraded and is grading from star One to star Six. A Community or Chat feature is added for player to exchange information and looking for game partner. The 3D graphic brings out the tension of the game and each dungeon and level is created in detail. There is an option to pay things to accelerate the game, but the developer is kind enough to not let the gap between free and paid item wide enough. The difference would be players who do not paid stuff to enhance their monster will have to play more level to get the paid stuff for free. It means the developer does not limit the feature, only make it harder to get, which make this game awesome. Overall, Summoners War for Android is all exciting and high-quality Android game without having to be hindered by cash.